1 col x 3 rows 8.5"x11"
Print event tickets, VIP passes, mailers, and more using your copy machine, laser printer, or inkjet printer! 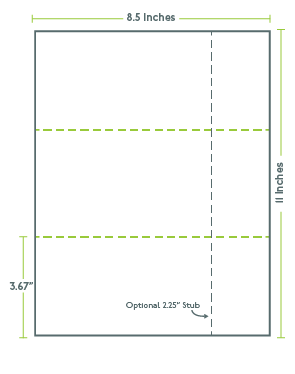 This letter-sized (8.5" x 11") layout is micro-perforated with 1 column and 3 rows, resulting in 3 individual pieces with optional, right margin stubs measuring 2.25". Print large raffle tickets, VIP passes, coupons, gift certificates, and more. Each clean-tearing piece measures 8.5 inches by 3.67 inches. Available in a variety of stocks as well as colors, including pink, blue, and red. Find top-notch, perforated blank card stocks and paper for your project or design your own on PerforatedPaper.com!